Quantum’s J/111 sails are a marriage of design, sail shape and rigorous production processes and standards that have created a product that performs consistently. Our designs are validated on the water through testing and racing, with feedback from the owners and Quantum team members. 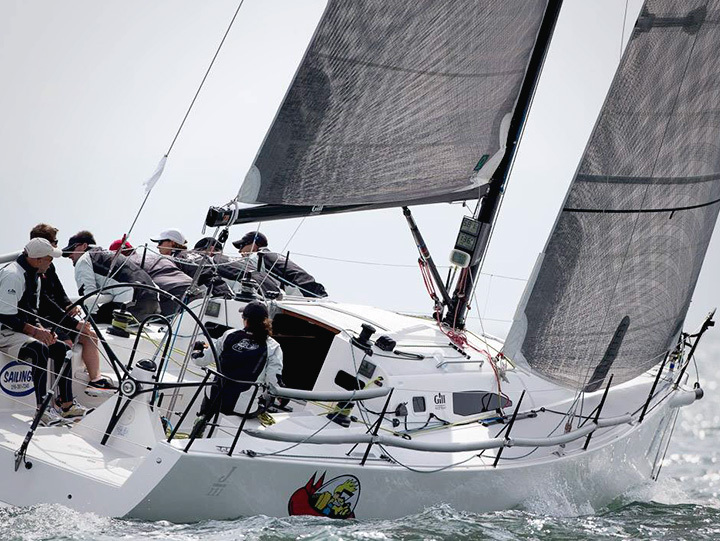 Our previous generation sails won the 2013/2014 North Americans and 2014 European Championships, with our latest generation, Fusion M® technology, winning the 2015 Worlds in Newport, Rhode Island. Our upwind sails are durable and fast, and our comprehensive tuning guide makes it easy to set up and tune for different conditions. One of the key components of our upwind sails is how well they work together. The main and jibs are well matched, and Quantum’s five jib designs are specifically engineered for set wind ranges and conditions. Quantum also offers five asymmetrical spinnakers in designs that are race-tested and fast, built for racing across the wind range. Give your Quantum J/111 class contact a call to get more information on our fast and updated designs, and find out how we can help get your program on the podium. This Fusion M™ membrane sail is constructed with carbon and black Twaron® yarns, resulting in a low-stretch, highly durable material. Extra fiber passes add extra durability while ensuring peak performance throughout the entire expected wind range. The design has evolved over the years and has been fine-tuned for the J/111. The main is offered with a bolt rope to be used in the groove or with an Antal 40 luff slide system. J/111 mainsail includes sail numbers, insigna, ISAF Measurement Sticker, Cunningham, leech cord with a cleat, telltales, sail ties, full-length sail bag, race five (full-top) batten pockets, one reef, Antal Batten Car w/ Joint, Antal Intermediate Slider and Sailman 35 batten system. This product may be ordered through your local rep or a class expert. The light jib features 12,000 denier at the mid-leech of the sail and is constructed with a mixture of carbon and Twaron®. Utilizing the latest technology in scrim and laminates, this product is designed to be a high performance and long lasting sail. Our teams have had great success with this sail in 0-12 knots. Sail includes full-length Grand Prix Headsail Turtle, ISAF Measurement Sticker and T-Ring. The Light Wave Jib features 10,000 denier at the mid leech and is constructed with a mixture of carbon and Twaron®. Utilizing the latest technology in scrim and laminates, this product is designed to be a high-performance, long-lasting sail. ​Our teams have had great success with the Light Wave Jib, which includes a full entry for easy driving in waves and chop. This sail is a max–size, full camber sail with power that allows teams to sheet hard with inhauler, allowing the boat to sail high and live in tight lanes. The sail is flexible enough to allow the team to ease the inhauler, sheet, and drop the lead aft to sail a faster straight line. Sail includes full-length Grand Prix Headsail Turtle, ISAF Measurement Sticker and T- Ring. The Medium Jib features 14,000 denier at the mid leech of the sail and is constructed with a mixture of carbon and Twaron®. Utilizing the latest technology in scrim and laminates, this product is designed to be a high-performance, long-lasting sail. Our teams have had great success withthis sail in 10-20 knots. Sail includes full-length Grand Prix Headsail Turtle, ISAF Measurement Sticker and T-Ring. The J3 Heavy Jib features 16,000 denier at the mid leech and is constructed with a mixture of carbon and Twaron®. Utilizing the latest technology in scrim and laminates, this product isdesigned to be a high-performance, long-lasting sail. Our teams have had great success with this sail in 16-24 knots. Sail includes full-length Grand Prix Headsail Turtle, ISAF Measurement Sticker and T-Ring. The J3.5 Heavy Jib features 18,000 denier at the mid leech and is constructed with a mixture of carbon and Twaron®. Utilizing the latest technology in scrim and laminates, this product is designed to be a high-performance, long-lasting sail. It meets the class requirements for aheavy weather jib, which must be under a maximum area of 29.33 m2, and is designed for winds more than 24 knots. A smaller jib, it must be furled, so we provide roller battens in the leech. It also includes a head pennant for the sail to furl properly in the Facnor Furling System. Sail includes full-length Grand Prix Headsail Turtle, ISAF Measurement Sticker and T-Ring. This running sail can be used any time the wind is less than 9 knots. The VMG shape performs great in lighter wind conditions. This sail was the light air weapon used by Wind Czar to win the 2014 North American Championships. Sail includes Grand Prix Spinnaker Duffle, Inked V Trim Stripes, Inked Sail Numbers, Lower Lazy Sheet Preventer, Take Down Patch, Take Down Line (Foot), ISAF Measurement Sticker, Spectra Clew Strop (1 Meter). This sail is our everyday windward/leeward course racing runner. It is full sized with maximum projection for great downwind speed. The sail is designed to perform from the lightest conditions to 25 knots. Sail includes Grand Prix Spinnaker Duffle, Telltales, Leech, Luff, and Foot cords; Inked Sail Numbers; Lower Lazy Sheet Preventer; Take Down Line Tack Pouch; Take Down Patch; Take Down Line (Foot); ISAF Measurement Sticker; Spectra Clew Strop (1 Meter). This is the perfect sail for a heavy air run on a windward/leeward course. It is a strong, full-sized asymmetrical constructed with Airx 700. It can sail hotter angles to get the boat to plane, yet the shape is versatile enough to run when the wind lets up. Sail includes Grand Prix Spinnaker Duffle, Inked Sail Numbers, Inked V Trim Stripes, Lower Lazy Sheet Preventer, Take Down Patch, Take Down Line (Foot), ISAF Measurement Sticker, Spectra Clew Strop (1 Meter). The A3 is a downwind reaching sail. At 10 m2, it’s under the maximum size of the class rules. The reaching shape is fast in wind angles from 80-135 apparent. The mid girth is narrower, and the overall depth is flatter than the A2. It is a true reaching performer and can double as a heavy wind sail. Sail includes Grand Prix Spinnaker Duffle; Inked Sail Numbers; Inked V Trim Stripes; Leech, Luff and Foot Cords; Lower Lazy Sheet Preventer; Take Down Line Tack Pouch; Take Down Patch; Take Down Line (Foot); ISAF Measurement Sticker; Spectra Clew Strop (1 Meter). When Kerry Klingler was eight years old, his father decided sailing would be a good sport for the family to enjoy together. Kerry and his dad learned to sail at the same time, and Kerry fell in love. He started to race competitively at the local yacht club, and by the time he was a senior in high school he knew he wanted to make the sailing industry his career. He dreamed of life as a sailmaker and decided to pursue that dream. Kerry jumped into the industry and found himself not only making sails, but running a loft as well. While he appreciated the opportunity to stay in the industry, he felt his talents growing stale. "I was designing sails, but no one was pushing me to the next level as a maker or designer," he said. "I started looking for a position where I could design with a company that was technologically advanced so I could become a better, smarter, more advanced sail designer." He found that opportunity at Quantum Sails. As the J-Boat Team Leader, Kerry not only designs sails for some of the largest One Design fleets, he also gets out of the loft to help his clients get the most out of every sail. Though people recognize him as a dedicated sailmaker, he’s also working hard all the time to provide the best service and products for their boats. "I teach them first," he said. "I show them how to tune the boat, how the sail should sit on the boat, how to trim it, and more. It's a pretty comprehensive session where I try to infuse as much knowledge as possible." Numerous big boat races, including success on J/133 and J/146. Most recently winning the Newport to Bermuda race on Apollo, a new J/121. Scott Nixon has been involved with racing his whole life. An All-American sailor at St. Mary’s College of Maryland, Scott later coached many students to the All-American ranks at the College of Charleston in South Carolina. He has a wide range of racing experiences, including dinghies, One Design keelboats, inshore big boats, and offshore distance racing. Scott joined Quantum Sails in 2000, and his experiences bring a unique skill-set to Quantum’s programs. Focusing primarily on One Design classes, he is directly involved in testing, design, and development of Quantum’s One Design sail programs, working directly with the design team to make sure Quantum® sails are at the front of the fleet. Scott has sailed with Quantum customers to win championships at the world, Gold Cup, European, North American, and national levels. His hands-on approach includes active campaigns and racing in the following classes for Quantum: J/22, J/24, J/70, J/80, J/109, J/111, C&C 30, Farr 30, Farr 40, NYYC 42, Swan 45, Melges 20, Melges 24, and Melges 32. When Gary Leduc was five years old, his neighbor offered to teach him to sail if Gary would help him put together a wooden skiff. Gary agreed, and he’s been sailing ever since. A lifelong fan of the water, he spent most of his high school and college years sailing and surfing, even missing school to enjoy the water. When his neighbor, and owner of Manchester Sails, heard about Gary’s passion, he offered to teach Gary how to make sails. That offer turned into a career in the sailmaking industry. Gary started making sails in 1969. He has been working at Quantum Bristol for more than 20 years, since before they joined Quantum Sails. He learned his trade the traditional way, making everything by hand. Today, his main focus is designing all types of cruising sails for yachts up to 60 feet. Jeff Thorpe was eight years old when he started the Leo Robbins sailing program. The instructor told his dad that Jeff wasn’t cut out for sailing, but Jeff went back the next season and hasn’t stopped sailing since. Throughout high school he raced Sabots, Lasers, and Laser 2s. When it was time for college, he didn’t have the money, so he took a job building and racing Morc boats at Pinnacle Yacht Design Group. Jeff stayed involved in the marine industry in a variety of ways, from an Olympic campaign with friends to fixing and rebuilding J/24s at his own shop to working in a sail loft. While working at the loft, he had the opportunity to sail on a J/125 with Quantum sails. Jeff was impressed with what he saw. He contacted Quantum Sails and told them he needed to work for them. Today Jeff works as a sail consultant at the Quantum Pacific loft, giving his clients the attention to detail they need to find the right sails. With his extensive sailing history, he’s more than qualified to help others figure out exactly what they need to meet their goals. "I spent years running offshore racing programs, so I have a fair bit of knowledge that helps me provide my clients with a great resource when they have questions," said Jeff. "I make sure they understand all the options available to them to help them enjoy their sailing." Jeff's sailing experience includes J/70, J/111, J/105, J/125, Melges 24, Olson 30, E-22, PHRF, ORR, IRC, TP 52, Santa Cruz 70, and Santa Cruz 52 classes, as well as offshore catamarans, cruising boats, and racing boats. Kris Werner is a graduate of New York Maritime College at Fort Schuyler, where he earned an unlimited tonnage/oceans USCG license and a Bachelor of Science degree in marine transportation and business. For several years, Kris served as a collegiate sailing coach, bringing the team to a top 20 US ranking. He then served as a ship's officer on oceangoing tankers. Previous positions include a chief officer on the Rochester Fast Ferry, a broker with RCR Yachts, and designing with Steve Haarstick for Beneteau 40.7s, J/24s, and J/70s. For the past three years, Kris worked at Haarstick Sailmakers, becoming owner of the sail loft. Kris has extensive experience on offshore and one design racing campaigns, as both a driver and crew. In addition to a busy life sailing and running his business, Kris is the proud father of three energetic boys: Steven, Chase, and Austin.